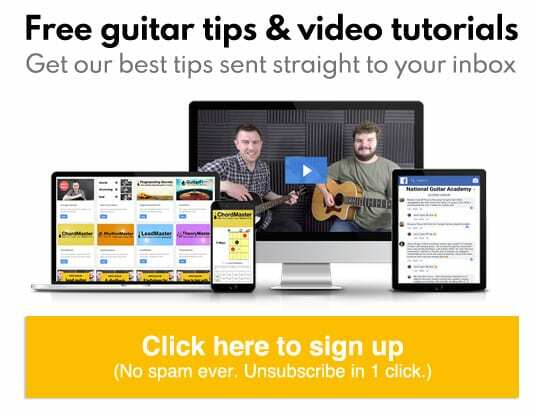 Want to learn guitar online? You’re in the right place; the National Guitar Academy provides the most comprehensive source of free guitar lessons on the internet. Let’s get started! 9 quick & easy tips to help you learn guitar online. 16 essential lessons for guitarists of ALL levels. 4 must-know tricks for guitar learners. So you want to learn guitar online? On this page, you’ll find a selection of lessons for beginner, intermediate and advanced guitarists in each of the above areas. Top Tip: There’s a lot of useful stuff here. You may want to bookmark this page or save it for later. Don’t try and learn everything at once. Pace yourself and enjoy the journey! It’s essential that you learn how to play guitar chords. Chords form the basis of 99% of all music. If you want to learn how to play music, you must know how to play guitar chords. What chords must I know? Learning how to strum is essential for all beginner guitarists. Learning how to strum makes you sound musical and is a great way to sound amazing quickly. It’s also essential that you learn how to hold a pick correctly. Guitar scales help you create amazing solos, but also teach you the ‘DNA’ of music. 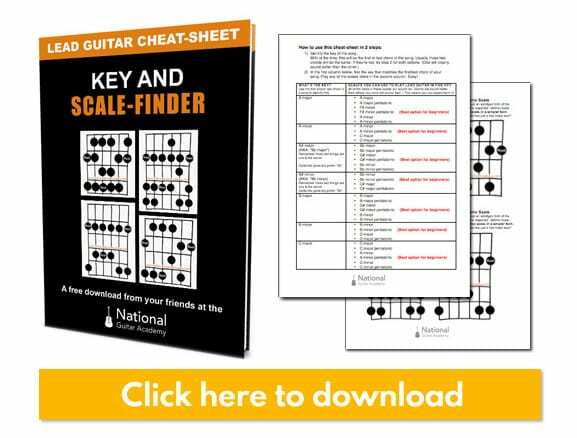 It’s not essential that a beginner guitarist understands scales, but it’s certainly useful to know some scales because it will give you an insight into some of the more advanced stuff that will come later! Soloing is one of the BEST things you can do on the guitar and without knowing some guitar scales you will find this very hard. Beginner guitarists often struggle in this area because they simply don’t know where to start. Want to see some mega-riffs you can learn right now? Ok, let’s move on to some intermediate lessons and take things up a notch! Once you’ve learned how to strum, a cool way of developing your musicality is to learn some strumming patterns. If you can learn a few strumming patterns, you will find it easier to play songs. With this in mind… If you want to learn some cool guitar songs, check out the following guides! Once you get to an intermediate level it’s important to know some guitar scales. Another cool scale to learn is the blues scale. Once you’ve learned the pentatonic scale, it’s time to dig into the detail of how to play lead guitar. Hold on tight friend… This is going to be amazing! There are loads of different techniques which you can enjoy like string-bending, pull-offs and alternate picking. Once you know all of the beginner and intermediate barre chords, it’s important to understand what keys these guitar chords come from. The 5 main guitar keys that you need to know are C, A, G, E and D.
Once you have a solid understanding and “feel” of strumming technique, it’s time to try and broaden your musical vocabulary. One way of doing this is to check out other genres of music. When you do this, pay attention to how different types of musicians approach strumming. If you want to be the best guitarist you can be, it’s important to play a wide range of genres. Classical Guitar Lessons: The 4-step system for learning classical guitar: Chords, fingerstyle, arpeggios, scales. If you want to experiment with various types of strumming, you could also try playing the guitar with your fingers. This is often called “fingerpicking” or “fingerstyle”. Minor pentatonic scales are fantastic for intermediate guitarists but once you know how to play these scales, you may find pentatonics a tiny bit limiting and bland. When you reach this point, it’s time to upgrade your guitar knowledge! The full 2-octave major scale can be used across lots of different genres and is deceptively versatile. If you find that the major scale is too easy, the next step is to learn jazz scales. These scales are essential to know if you want to become an advanced guitarist. Once you’ve grasped the concept of techniques like string-bending, alternate picking and sliding, it’s time to graduate and start trying different guitar-based genres. The perfect genre for exploring lead guitar, is the blues. Blues is great for learning how to enhance your soloing and wring every last drop of musicality out of every note. Another way to spice up your lead guitar playing, is to learn some guitar tricks. There are advantages and disadvantages to learning online. One of the best thing about learning guitar online, is that 90% of the tuition is free. There are loads of freelancers out there who are providing guitar lessons on social media platforms such as Facebook and YouTube. Of course, the maxim “you get what you pay for” is often true. Sometimes, “free” does not equal “high quality”! If you learn guitar online, chances are you don’t have a teacher. So therefore, there is less pressure for you to practice every week. You can learn guitar in your own time and at your own pace. Some people much prefer this pace of learning and lack of scrutiny. There are advantages to choosing to learn guitar online, but there are some drawbacks too. Let’s look at the “cons” of choosing to learn guitar online. Even though learning guitar through YouTube can be fun. There’s no way of actually developing a personal relationship with a tutor when you learn guitar online. Sure, you can email them but this is not the same as meeting someone in person and learning guitar from them in the same room. If you’re new to learning the guitar, it can be difficult to spot a bad tutor. When you learn guitar online, if you’re taught by a bad guitar teacher, you’re going to pick up their bad habits! There are good teaching sites out there… JamPlay, Yousician, Guitar Tricks, JustinGuitar etc…. So pick wisely! And of course if you want high-quality, reliable, PROVEN teaching material you’ll find hundreds of hours of content right here on this site. Following online guitar lessons can be fun, however when it comes to guitar practice, it can be difficult to motivate yourself to practice. Your practice regime is a crucial element in your progress as a guitarist. One of the worst things about choosing to learn guitar online is that so many guitar teachers teach too fast. They try to teach everything in one go. It’s like trying to drink from a fire hose! Also, lessons rarely fit into any kind of overall programme. It can leave the student feeling disorientated and not understanding “how things fit together”. This can actually SLOW your progress as a guitar player because it makes learning the guitar more difficult. Is the internet bad for learning the guitar? No. The internet is one of the greatest things which has happened to the guitar community! It has some AMAZING resources. We’re just saying “be careful”. When you learn guitar online, try to be mindful of whether you’re learning from someone with experience. Are they making things simpler? Can they communicate clearly? Do you have ‘aha!’ moments while watching their lessons?